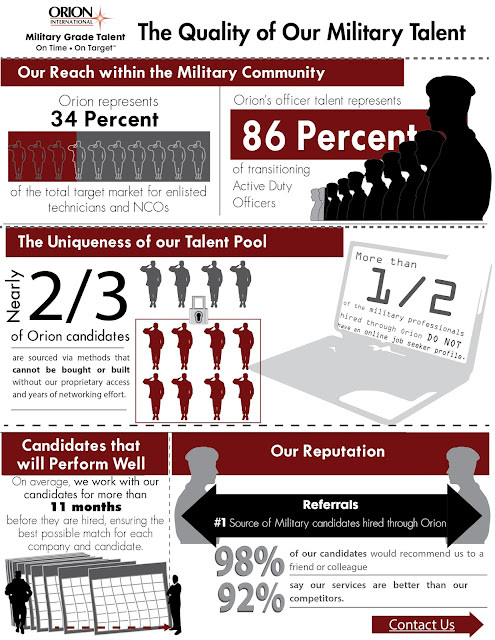 Orion is the nation's leading provider of best-in-class Military Talent Programs which enable organizations to attract, hire, develop, and retain Military Talent. We are the subject matter experts in military hiring, and we have invested 24+ years in building and developing far-reaching networks into the military community. Rather than just providing the talent, we provide the right match, leading to an On Target hire -- the best possible fit for each candidate and client company we represent. Want to know more about the veteran candidates we represent? Check out the infographic below or click here.